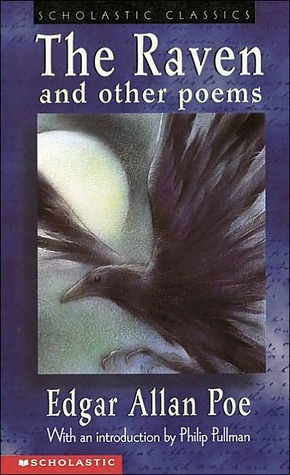 Many scholars focus on the raven. The bird has become associated with dark, mysterious places and days. Just watch any Halloween movie and you’ll see one, perched ominously on the rusty gate of an abandoned house or an illegible tombstone in a foggy cemetery. Poe himself titled the poem “The Raven,” drawing the reader’s attention to its dark messenger before even getting to the first line. This Halloween, I want to focus on an equally important word in the poem, one that I think does even more than the raven to communicate the menacing tone of Poe’s work. It brings more distress to the narrator than loss or fear. It drives him to eventual madness: nevermore. The narrator begins the poem as many of us do, reading late into the night, trying to forget the troubles of his day. Maybe you even picked up “The Raven” looking for the exact same thing. How many times have we all “nodded, nearly napping” while reading before shutting off the light and going to sleep? He hears a faint sound and dismisses it, as we all would, as “some visitor… nothing more.” He even goes so far as to open the door but seeing nothing but darkness, his imagination begins to run wild with fear. The rapping returns, this time at his window and he opens it to find a raven. The raven comes in, unusually calm for a wild bird, sits on top of a bust, and proceeds to answer each of the narrator’s questions with one word. Just as the poem begins in a mundane and perfectly typical scene—a lonely guy reading in bed, trying to forget his girlfriend—so do his questions. He starts by asking the raven his name, to which the bird replies “nevermore.” The narrator is amused, thinking this an absurd name for a bird, attributing it “little meaning, little relevancy.” But soon his thoughts turn darker. He begins to think about that word, wondering what the raven means when he says it. The word itself begins to take a hold in his mind. He fears he will “nevermore” be able to get past his lost love. He fears he will not see her in heaven. He fears that there is no cure for his heartache. Finally, he fears that the raven will never leave and that he, the heartbroken, will be haunted by that word. When a friend asks you if their ex-girl or boyfriend will ever come back, you say “maybe” or “perhaps.” If you don’t think there’s a very good chance, you could even say “probably not” and still leave a small opening for hope and possibility. When someone asks you if they will ever get over the loss of a loved one, you say “eventually” or “with time.” But Poe does not use any of these words to answer the narrator’s questions. Instead, he turns to the absolute. The raven answers with a word devoid of any hope of reconciliation, healing, or even closure. When finally pleaded with to leave, to leave the now distraught narrator with peace, if not with hope, the raven answers again, “nevermore.” Although it takes him a few stanzas, the narrator realizes the significance of the word “nevermore.” And it drives him into despair and insanity. Poe uses plenty of dark imagery to convey the menacing tone necessary for a poem about heartbreak and loss. From the very first line to the description of the room’s furniture, Poe evokes a dark, damp, and forgotten atmosphere. The “bleak December” night, full of shadows from a neglected fire, does nothing to alleviate this ominous mood. The narrator himself is scared into a frenzy just by a faint tapping at his door. When the raven finally appears, all the more frightening for his unconventionally composed and precise manner, the reader and narrator both are about to jump out of their skin. Add to that the image of dark curtains and heavy, velvet chairs, as well as the use of words like “croaking,” “ghastly,” and “gaunt” and it’s no wonder that the reader is caught up in the narrator’s descent into fear. But the word that really pushes the narrator, and by extension the reader, over the edge is the final one, made even more significant for its placement within the stanzas. The word that the raven repeats and repeats, never allowing the narrator to escape its finality.